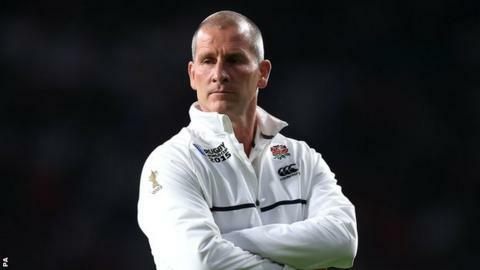 Former England head coach Stuart Lancaster says he is still affected by their World Cup failure, but is now ready to return to full-time coaching. Lancaster left his role with England after they were knocked out in the pool stages of last year's home tournament. "You think about it every minute of most days, or every day really," Lancaster, 46, told Sportsweek. "It has been a while, and a lot of things have happened since then, but it's still fresh in my mind." The hosts were eliminated from the World Cup when they were beaten by Australia - a week after a dramatic loss to Wales - and Lancaster says he accepts responsibility for England's failure. "I was accountable more than anyone. I was the head coach and it was my responsibility to lead the team," he said. "I'm delighted for the players, the management and the coaches that we got the Grand Slam," he continued. "I'm equally delighted for the England rugby fans, because they stayed behind the team right the way throughout. They all deserve the success. "I will always support the England team - whether it is players and coaches - and that will never change." "I don't feel so burnt by the whole experience that I don't want to coach again," he said. "You need a new project to get your teeth into, otherwise you are always dwelling on the old one. "The lure of coaching Super Rugby is a big one for me personally. The southern hemisphere would be a tremendous challenge and a great opportunity. "Hopefully something will come around the corner soon, but there aren't many jobs in Super Rugby that are going to come up and there aren't many jobs in the Premiership that are going to come up. "You have to weigh up your family as well, [so] whichever way you look it's a big decision, and I want to make it the right decision." In a wide-ranging, exclusive interview with Garry Richardson on Sportsweek, Lancaster reflected on captain Chris Robshaw's decision at the end of the tight match against Wales to kick to touch instead of for goal, the Sam Burgess affair, the impact the World Cup had on his family, and where he goes next. "Chris was a brilliant captain for us and for me personally. I certainly wouldn't have anything said about that particular decision or what we did in the lead up to it. "Games are never won or lost on one moment. "Clearly the result against Wales was the critical moment in the World Cup for us. We were 22-12 up nearly 60 minutes into the game, and we lost a game we should have won. "The reality was that we put ourselves in a position to win the game. "I guess what disappointed me a little bit was the way Wales were allowed to stay in the game. Dan Biggar had an unbelievable kicking game to be honest, but we should have seen the game out. I think that was the frustration from everyone's point of view, players and coaches included." "It's a shame for everyone really. I don't think there was any winner in the end. "Clearly, hindsight is a wonderful thing. If I'd known he was going to go back to rugby league then my decisions would have been different, but we didn't know that at the time. "He was a great and positive influence on the group. He worked hard and earned the right, in our minds, to be in the squad. "I think there's a perception that I somehow went on a crusade to try and recruit him from rugby league. Actually, what happened was I went to Australia and watched a game [Australia v New Zealand] and I popped in to see various coaches along the way. "We had a chat and he said 'I want to have a think about playing rugby union, how do I go about doing it?'" "My wife and my daughter came down and my mum and my dad [to the Australia game - which England lost 33-13]. Fortunately my wife took them out of the stadium before the game finished. She saw when we lost Owen [Farrell] to the sin bin that the die was cast. It was a sensible move. "You're then sat there in your hotel room at two o'clock in the morning, waiting for a press conference at 9 o'clock in the morning with the chief executive to face the world's media to say 'you're out of a home World Cup and you've got another week to go to play Uruguay'. That is tough. "The first thing I did after the Uruguay game was to come back to Leeds, but also to quickly get up to Cumbria to see my mum and dad. They're the ones that feel the pain more than anyone. It's probably only mum who can describe the pain she feels when someone is criticising her son. "They took their caravan to Lorton and I sat in a caravan in Lorton and walked up fells in the Lake District. "I walked up St Bees Head, where I went to school, and right at the top I bumped into this bloke and he said 'you're Stuart Lancaster aren't you?'. "Anyway, I went back to the caravan. I had the review around the corner and so I wanted to think things through, and while it was fresh in my mind, write things down. "So I did that in the caravan and there was a little pub called the Wheatsheaf and I went in there for a beer, which ended up being about eight. There were about five people in the pub at the time." "Before Christmas I sent a whole load of emails out to coaches and players and teams and people in the southern hemisphere. Early in the new year I went initially to Wellington, then I went to Brisbane, Sydney, Melbourne, Perth, Johannesburg, Cape Town and home. So it was a bit of an around-the-world trip. "I want to coach again. The one thing the World Cup has taught me is that whilst my title was head coach, I probably took on so much that I wasn't doing as much coaching as I really would want to. "In my next role I'd want someone to share the responsibility with me so I could concentrate on the coaching stuff, and that was as much my fault as anyone's. I probably could have got someone in who could have helped me shoulder the burden." "Hopefully [the team] has been passed on in a good shape and with good, talented players coming through. Eddie has done a brilliant job in moulding them and getting the best out of them this Six Nations. "We met a couple of weeks after Eddie got the job. I don't see any point in learning all the lessons I learned and not passing them on - that would be ludicrous. "Hopefully he appreciated the insight I gave him, and clearly he has put his own mark on the team. We had a good chat."